Sometimes it is directly said and sometimes it is an expectation. Much of our education system has been working with this paradigm for decades. The idea is that sitting down and being quiet leads to better grades, more retention, better students and better employees. In all honesty, I don’t truly have a problem with the idea of sitting down and shutting up provided that there is also an opportunity to stand up and make a ruckus. This opportunity to SUMR used to happen outside of school but most activities are now adult driven. In a recent interview, I was asked “why do you think teens are so stressed today?” The answer to the question is relatively simple but the resolution is much more complex. The simple answer is expectation. The modern teenager has been thrust into a world of paradoxical expectation. 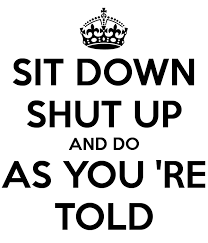 For years on end, kids today are taught that the secret to survival is to sit down, shut up and follow directions. Those who learn these lessons are lauded for a few years until they reach a point where they need to make their own decisions. At that point, they are expected to know how to use their judgement but that faculty has never been exercised and is therefore weak. Those who rebel against the SDSUFD model are labeled as troublemakers and given fewer opportunities for advancement. They see that the system doesn’t like them and they don’t care for the system either. Systems are only valuable as long as they work. SDSUFD only partially works and needs to be adjusted. Humans were built for action. We were meant to fly! Unfortunately the mixture of old systems and new circumstances have clipped our wings or made us believe that we have none. We’ve been made to believe that we are supposed to wait for someone else to tell us what to do. That we are supposed to be more robotic, more efficient and less emotional. This is completely contrary to everything that human beings are. We are animals that are most efficient when our emotions are in line with our objectives. So what does this mean for each of us? If you are a teenager, you need to balance your daily SDSUFD with SUMR. You need to have an outlet, either mental, physical and/or emotional that you choose. Begin the process of getting your hands onto the steering wheel of your life. You’re most likely not ready to have full control of your life yet but you should not be in the backseat either. If you’re in your twenties or older, take a hard look at your life and decide how much of your life belongs to you. This is not a call to buck all authority or burn every bridge in your life. It is a call to more action for your own betterment. Sometimes that action will be that you need to “sit down, shut up and listen”. Then you need to stand up and act on what you’ve heard. Step forward and take your role as the star of your own TV show. If you are playing a secondary role in someone else’s show, then you need to rewrite the script. Take today as if it belonged to you because truly it does.